Summer Area: W. Med -Naples/Sicily, Greece, W. Med -Riviera/Cors/Sard. Accommodation aboard offers four double staterooms with en-suite facilities. 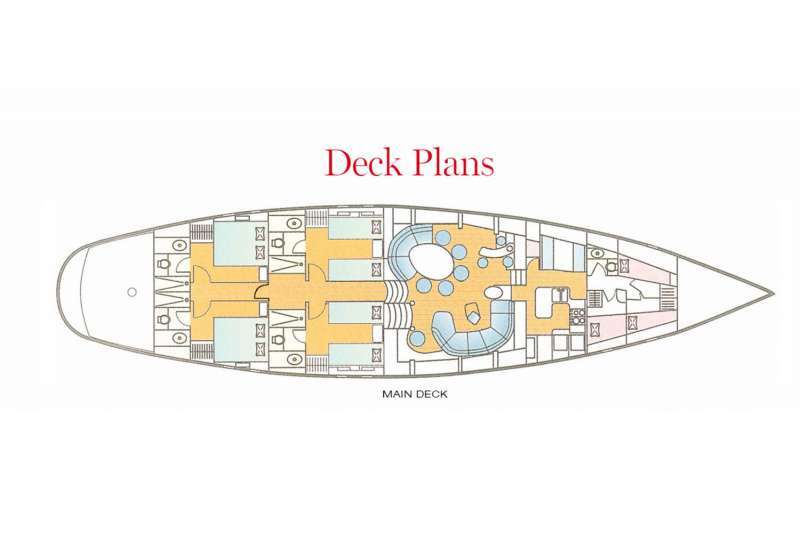 All four staterooms are equipped with double beds and the aft staterooms can be combined and used as a single large cabin for more comfort and extra privacy. The beds in the two front cabins can be converted into twin single beds. “We are passionate about life and our profession”. This is how Patrice describes the crew of Persistence. Captain of Persistence since 2015, his passion for the sea becomes a profession in 2000 when he first started cruising in the Mediterranean Sea and then in the Caribbean Sea. He has got the French Master 200 GT Certificate & Master 200 GT Yacht. Audrey works as deckhand and Engineer on board of Persistence since May 2016. Professional and passionate about her job, Audrey’s love for sailing and enthusiasm are contagious. She has got a Master 200 GT. Audrey practices several sports, like swimming, walking and yoga. She took part at the rebuilding of Persistence. A very attentive, pleasant and motivated person. In this case, the young age of Aurella is not a synonymous of inexperience. Joyous and dynamic person, during her numerous experiences, both as a chef and waitress, she learned every trade secrets. Her engaging character and her attention for details permit her to work also in the event planning business. Expert in the Mediterranean cuisine, as well as very passionate for the traditional French gastronomy, she will delight you with her courses.